Custom Cane Creek, Sealed, 1-1/2"
Continental CruiseCONTACT, 26" x 2.2"
Elby is a special creature, an electric bicycle designed from the ground up to be approachable, comfortable and responsive. Seriously, the drive system on this city/cruiser is also used on e-mountain bikes! It packs a lot of power and zip along with some cool power regeneration features and is near silent. The drive systems are all produced by BionX, a fixture in the industry and partner to other premium manufacturers like Mercedes SMART. The only real complaint I have is that the motor looks large, it’s like a gray pizza stuck in the middle of the rear wheel… but at least the other gray plastic accents on the bike (like the battery box) are matched. This is a nod to Elby and their attention to detail. You can choose from five glossy frame colors including white and silver (for increased night riding visual footprint) and I love that some of the plastic accents and fork are color matched for a cohesive visual appearance. Yeah, aside from the motor, the battery, compact control system and even the wires ae mostly hidden. 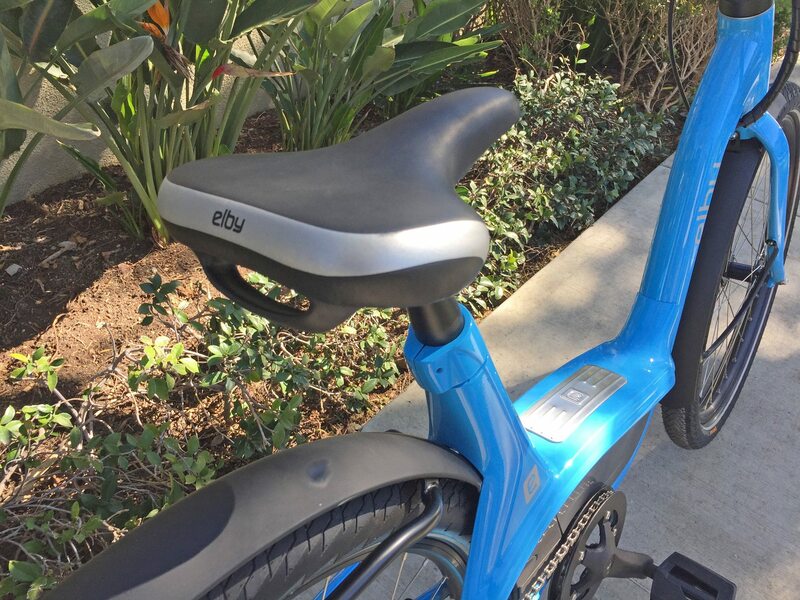 And while the Elby City only comes in one frame size, it’s designed to be highly adjustable, accommodating riders from 5 foot to 6.5 foot tall. The extra-long 500 mm seat post is thick and sturdy, the stem swivels up and down, even the swept-back “gull wing” handle bar can be swiveled to raise or lower and change reach. I love the ergonomic grips and slightly large but active saddle. Between these touch points and the thicker tires, you end up with a comfortable ride despite there being no suspension hardware. This keeps the bike lighter, cheaper and stiffer. 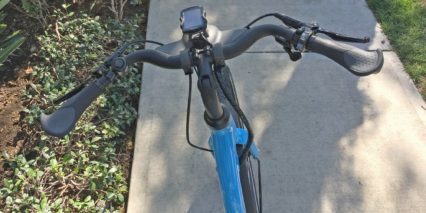 Many wave style deep step-thru frames used for electric bikes have this bendy feeling about them, as you pedal, turn and stop the frame flexes. That is not the case with the Elby thankfully and I’m glad because it honors the motor and premium hydraulic braing systems. 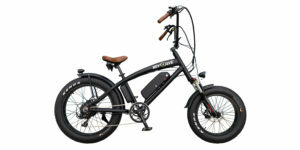 This is an awesome ebike, it’s just more expensive than some. And that’s interesting considering the direct to consumer model being tried out. You order online then pay an additional $99 for shipping/assembly and if you’re in a city where Velofix operates, they deliver it to your doorstep and set it up just right… even returning 30 days later for a free tuneup and adjustments. Driving the Elby is one of the most unique and effective hub motor systems I’m aware of. Yes BionX is an advertiser for EBR so you may interpret some of this as bias… but I invited them after having tested a number of systems across a range of electric bikes. This thing is years in the making and only compromises on visuals in my opinion. By designing something extra wide, they were able to achieve higher torque and better heat dissipation. The casing for the D-Series is plastic, keeping it light and durable, and it has an internal torque sensor that works well consistently. It’s one of the quietest high powered motors and I love how they tucked the power cable leading to it on the left side low and out of the way for snags or tips. Notice also that the rear wheel spokes connect to the hub and rim of the wheel, not to the hub motor casing. This provides a more natural ride and a bit of flex… so spokes don’t tend to loosen as much or break. I was told that the max weight for the Elby was 280 lbs by the rep but believe it’s actually 273 based on some literature at their site and some quick math. That’s still above average where many ebikes say 250. This allows for the addition of bags on the rear rack or for larger riders, tall, boxy and overweight. In my opinion, it has the power needed to move larger loads effectively, something people ask me about regularly. 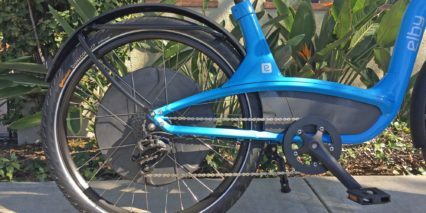 You get 500 watts nominal peaking around 1,000 with 50 Newton meters of torque that can be controlled with a throttle… that’s very unique in a world where more electric bikes are using mid-drive systems that require pedaling. Powering the motor, backlit color display and premium ebike specific lights is a high quality, custom designed, Lithium-ion battery pack. It offers 48 volts and 11.6 amp hours which is above average and the cells inside are produced by Panasonic, one of the top brands in the space. 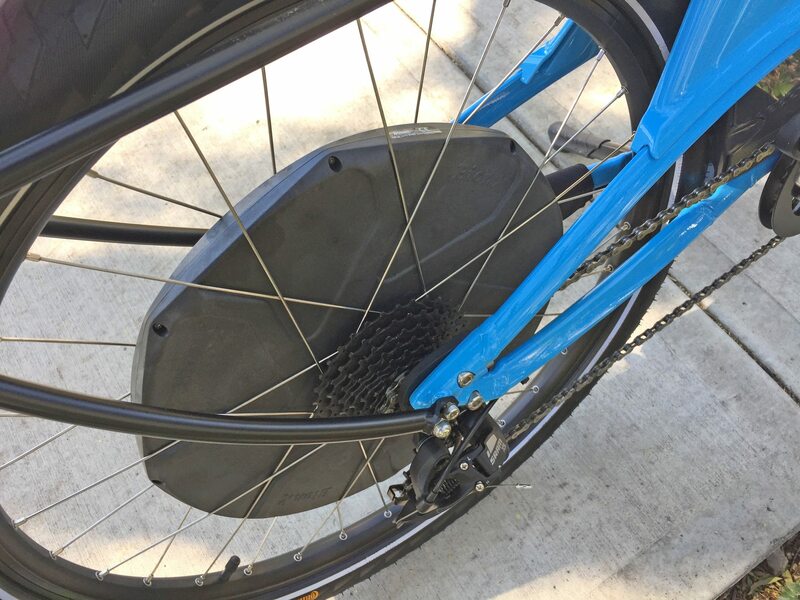 You can charge it on or off the bike and it locks securely with a key… but is kept hidden and perhaps protected by a plastic shell with stylized metal step pad. Now, I’m not sure I’d actually want to step on that, it looks too nice and might scratch over time. The downtube is low enough that most people should be able to step over easily. However, if you do scratch this plastic part or end up losing it (as you have to take it off for battery removal) I was told the company does sell replacements. 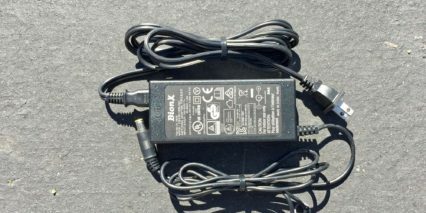 One unique and semi-confusing aspect of the battery is that it interfaces with the bike using an EnergyBus Rosenberger plug (very high quality, magnetically connected). 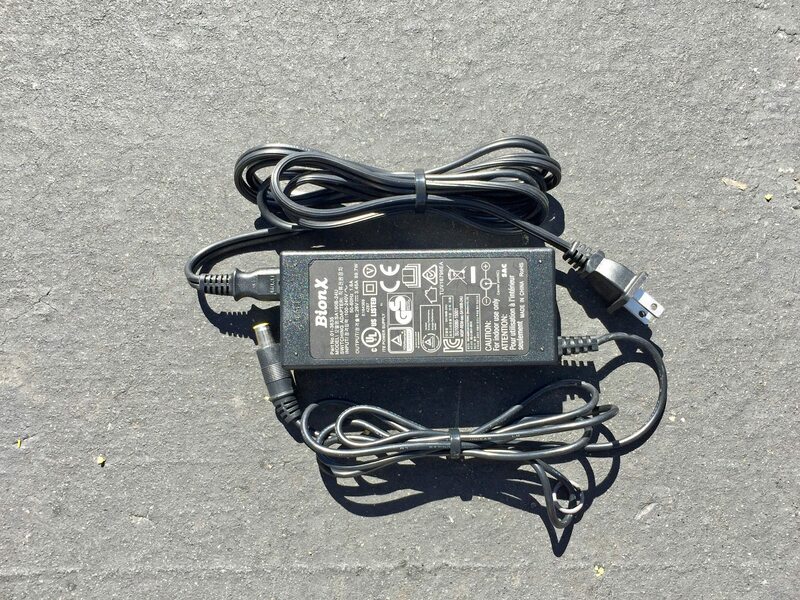 The plug is floating so it self-aligns easily and can transfer data and power… it’s like top of the line as far as plugs go :P but on the outside of the batter pack, the charger plug is more basic. It’s not magnetic and could get bent or pull the bike over like other more basic plugs. At least it’s kept mostly clear of the left crank arm and pedal but why not use the magnetic port there too? Yes, it would add to the already high cost of the bike and perhaps would have required a larger heavier charger. 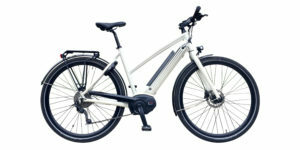 That’s one thing I love about the Elby and other BionX e-bikes, the charger is fast at 3.45 Amps but also super small and light weight making it very easy to take along to work or a friend’s house for a quick fill. One other grip I have about this mid-section of the bike is that the kickstand is mounted very near the left crank arm and will collide if you back the bike up or try to spin the cranks when parked. 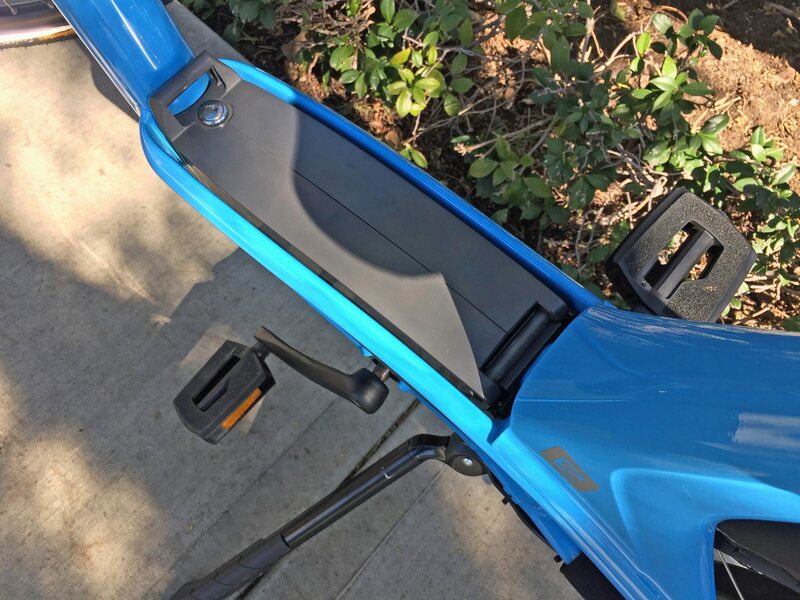 Many ebikes manufacturers are moving to a rear mounted kickstand but some feel these don’t look as nice (sticking out towards the back). I guess it’s just a small note and consideration. So the motor and battery are great, the display system and control pad follow along as being some of my favorite. The bike powers on with one click on the control ring (near the left grip) and the color backlit display blinks to life. The really neat thing here is that if you didn’t have the display, the control ring functions just fine on its own! It has an LED charge level chart and LED assist level chart that blinks when you go into regen (by pulling the right grip). 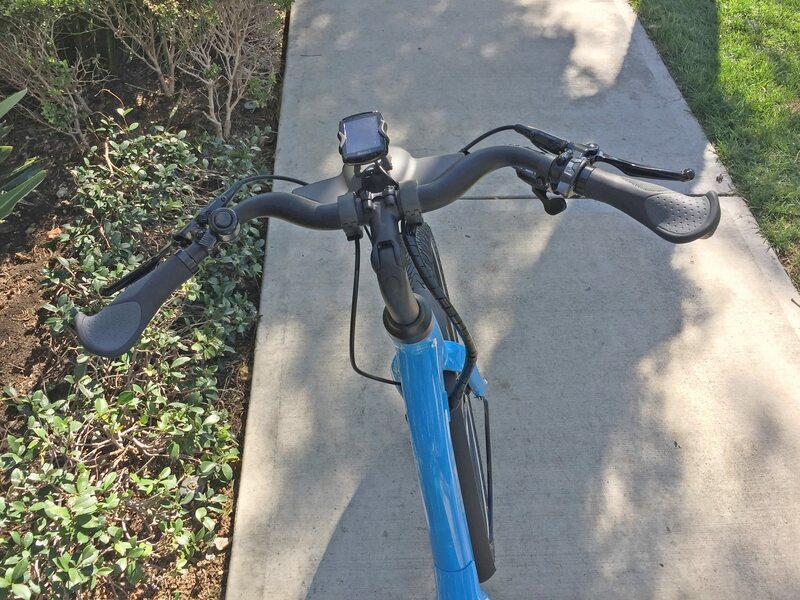 It’s slim so it doesn’t block the shifters or brake lever, mounted close so you can reach it easily, and intuitive with a plus and minus for assist level navigation and forward back for changing menu readouts. There’s a separate button just for the lights and that power button to turn it off again. But if you forget to turn it off, no worries… it powers down automatically after a few minutes on its own. We went in-depth on video above showing all of the settings and I listed them as well but this shouldn’t be overlooked. The button pad is great and the display is also awesome. 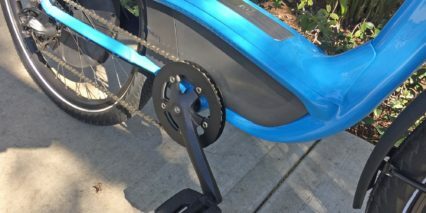 I love being able to take the fancy pieces off of electric bikes when parking in the elements or sketchy neighborhoods. 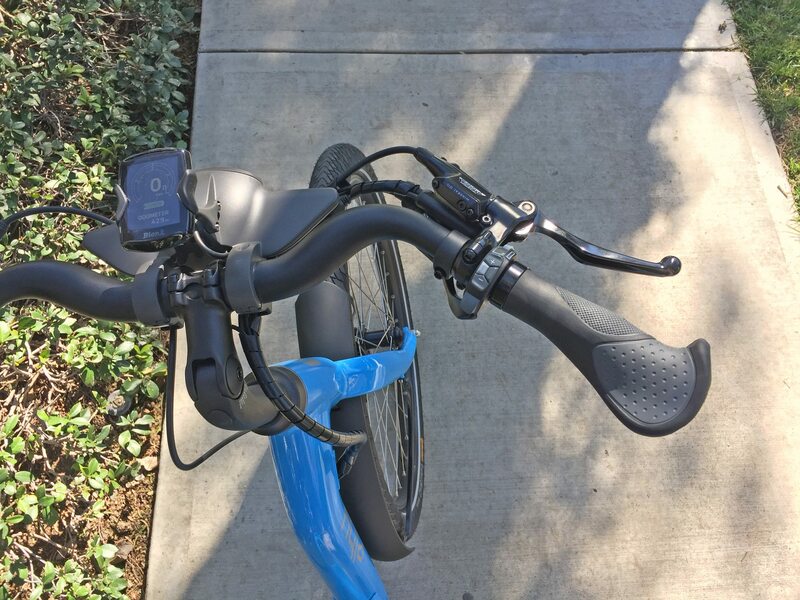 Nobody wants their fancy bike scratched or tinkered with and you might be wondering about the button ring… Couldn’t someone turn it on and press the throttle at the bike rack? Yes, they could turn it on and turn the lights on maybe but the throttle won’t activate until the bike is moving 5 km/h (for safety reasons) so this has the fortunate side effect of making it tamper resistant as well. So you get a bike only mode, four levels of assist, four levels of regen (which can slow you when coasting down hills or act as a fun workout mode) and regenerative braking activated by the right brake lever. As mentioned earlier, the brakes on the Elby are wonderful… You get 180 mm hydraulic disc brakes with adjustable reach levers that are ebike specific. Or, at least the right one is, the left one does not have a motor inhibitor regen switch in it unfortunately. This is another area that I’d like to see upgraded. You’d pay slightly more and have one tiny more wire but it would also add a bit more complexity to the control system. 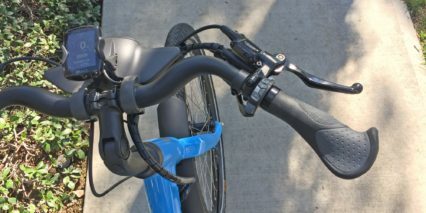 The way it is now is fine, but many other ebikes have two levers with motor inhibitors and I like that. It may seem like I’m gushing over the Elby City and that’s probably true. I’m a huge fan of the drive system and can see the care that went into its custom frame, light interface, optional phone mount and Bluetooth app. 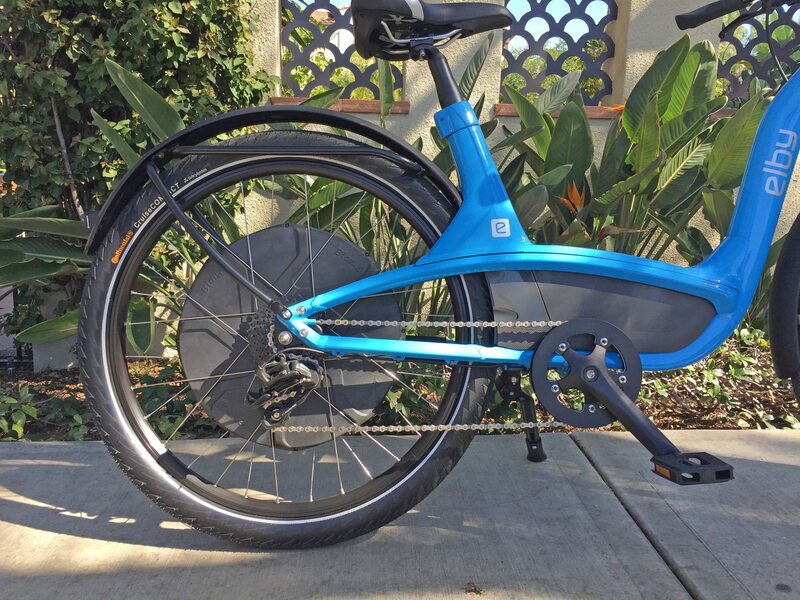 They give you basically everything here, the fenders are custom and oversized but still tight and out of the way when pedaling (specifically the front one which is pushed forward thanks to some rake in the fork which also stabilizes the ride). I’m excited about the experience and quality here but recognize that you really are paying for it. I wish the price was lower considering the Velofix delivery model. 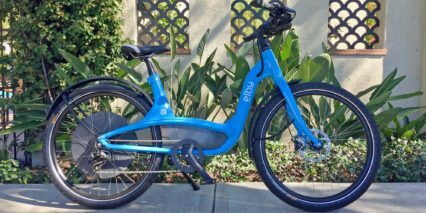 Perhaps some dealers will have the bike as well and it is available to test ride at the traveling ebike expo so check it out for yourself. Other highlights for me are the reflective and puncture resistant tires, upgraded Alex rims with reinforcement eyelets, reflective saddle with built in handle for easy lifting and moving. 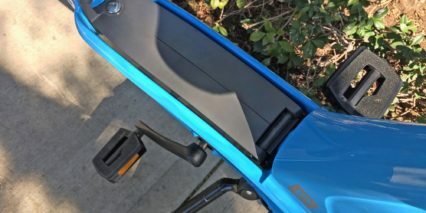 You may need a platform rack to move this electric bike with a car and in that case check out the Thule EasyFold Carrier with ramp which makes loading easier. I really like the idea of their Velofix partnership, it’s a way to reach a wider audience and ensure the bike is built well, it’s not available everywhere but does give them a jump start over dealer networks and you get a 30 day tuneup… in some ways I would have expected a lower overall price for the bike since there is no middleman, or maybe free shipping at least? Thank you so much for reviewing the Elby – I have been waiting anxiously to see this! The one statistic remaining that I need is the height from the top of the saddle seat, in its lowest position, to the ground – do you have that please? 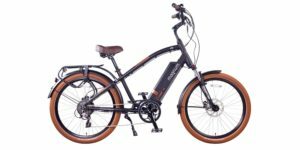 I have had a test ride on the 2017 Electra Townie Go 8i and found that it fit me very well and felt good riding however the two negatives (brakes and lack of Throttle-on-demand) keep me from taking the plunge. I do feel that I need the “flat-foot technology” though. I am a female senior citizen living in a ski-resort town with many groomed/paved bicycle trails but not a level one in sight near my home or anywhere else in the area for that matter. There is a fairly long and steep hill leading to my home so I worry about getting back up the hill after a long ride especially if I only have pedal-assist. I need a step-thru bike. I am a casual/cruiser style rider and not particularly interested in speed but must have hill climbing power when I need it. I also like the idea of regen to slow the bike down when going down-hill. The Elby specs seem to fit all my needs except that I don’t know whether the seat will go down low enough for me to reach the ground when seated (28″ inseam) – I can adjust the seat to a more appropriate height if needed as I become more comfortable with the bike. Do you have any thoughts/guidance about making a choice between the Elby and the Electra? Hi Pamelae, I just reached out to the Elby rep and asked him to do the measurement for you (top of the saddle when it’s in the lowest position down to the ground), he said it’s 33.5″ high. I do think this ebike would be a good fit for you as it’s one of the very few with step-thru and a fairly powerful motor and throttle mode. I usually post stand over height as the top of the frame to the ground because I tend to start standing up and kicking off then pushing myself up to the saddle. With this approach I think you’d be able to get into the saddle and use the throttle for near-instant power. 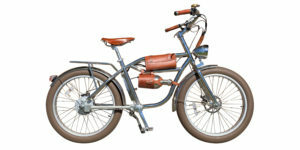 I do love the Electra Townie Go! but can see how the lack of throttle might be a big decision point. 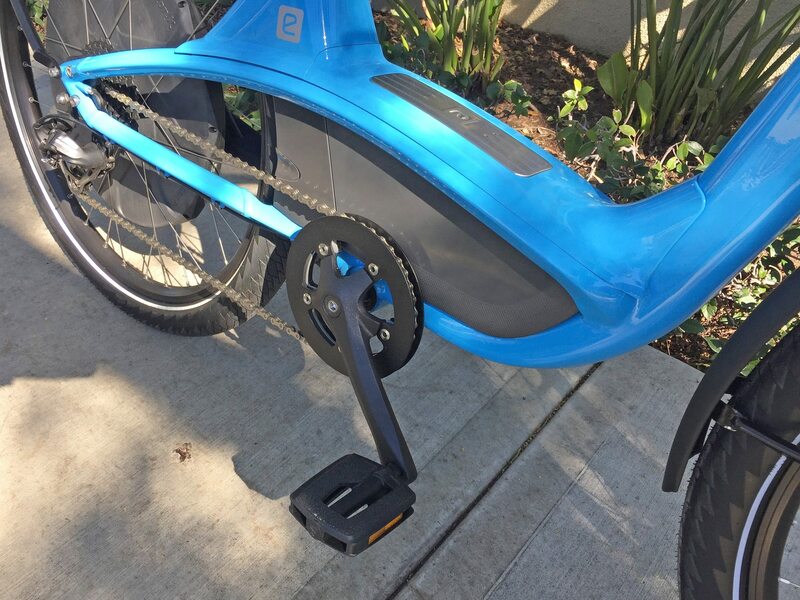 That ebike does have “flat foot” technology, meaning the cranks are slightly forward, but the ride isn’t substantially different from Elby and some others due to their more angled seat tube. In fact, you can see how the cranks on the Elby actually are positioned slightly forward imitating the Electra design here. 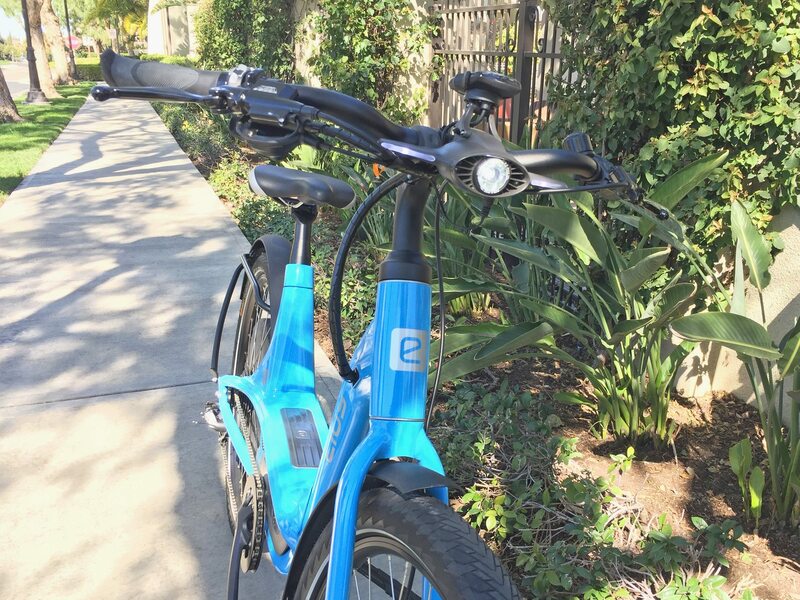 I test drove the Elby at electric cyclery where Kevin answered all my questions. I live in an extremely hilly neighborhood but I think this bike is going to do the job. 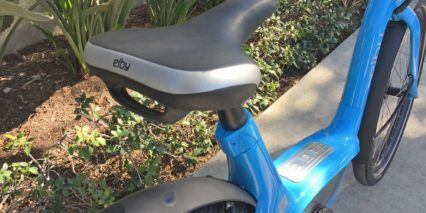 I test drove a much more expensive (and supposedly high quality ebike) and I found the Elby much for suitable for me. Awesome! Glad to hear that Kevin was good to you, I like their shop because it has so many great choices and demo bikes to explore. Yeah, Elby is great because it offers throttle mode and is super approachable, the BionX drive system is pretty great, the D-Series is one of my favorites because it’s so quiet and smooth… even offering regeneration! Thank you, Court, for finding out that information for me. Looks can certainly be deceiving – it looks as if the seat would slide down lower so that the height would be in the 29-30″ range . I will have to give it a test ride to see how it feels. Thanks again for your help and great reviews. Hi Court! Can you tell me if there are any differences between the 2016 and the 2017 models of the ELBY? I’m about to purchase this bike after seeing your review, and the dealer has 2016 models in his shop. They look exactly the same as the bike in your review, which is dated as a 2017 model. But I’m wondering if there are any technological differences. Hi George! I reached out to a lead at Elby with your question to get an accurate statement and received the following from their Director of Global Sales and Marketing “Elby distinguishes product changes by version number rather than model year. The Elby S1, is the same version number (1) in 2016, 2017, and 2018 and therefore identical.” so it sounds like you’d be fine with the 2016 model. I hope it works great for you! 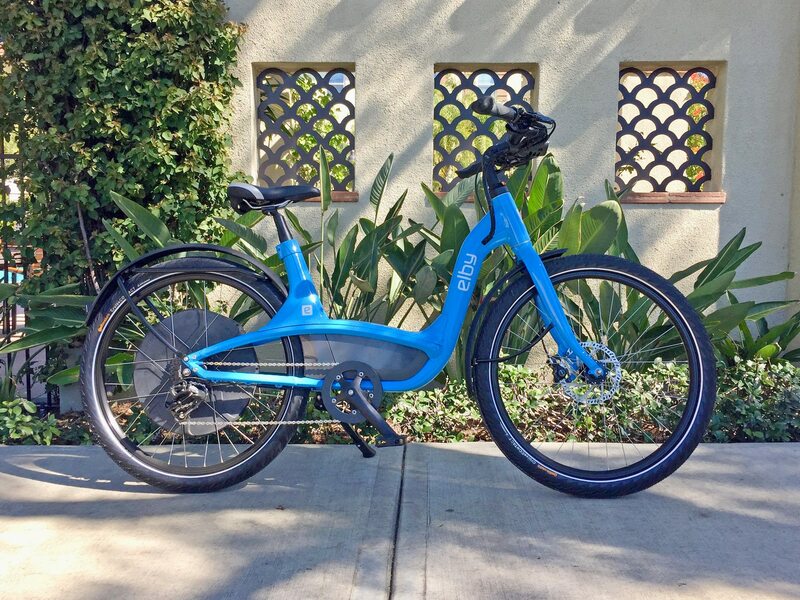 Elby is doing something special with their e-bikes and it’s neat to also see how quickly they respond to comments and questions to provide support. I just test rode the Elby 9 speed. I really like the balanced feel, the power, and the throttle. Having a throttle really helps getting started from a stop especially going up a hill. I also like the regenerative motor, it helps slow you down when going downhill a little bit like hill descent on a car. I’m not sure about the styling, maybe it’s just a hangup of mine. One styling issue I have that’s easy to make would be to make the motor casing round. I’m a graphic designer, I find the flat edges on the motor casing awkward in the round wheel. It would be great if they made the casing round and added a reflective ring on it. 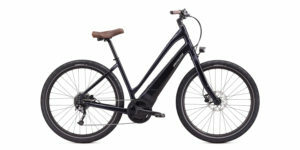 Other bikes I’m considering at the Gazelle Arroyo, Kalkhoff Agattu B7, and Stromer ST1 Elite. Do any of the guys out there feel odd riding a step-through model? Hi Bryan, all great feedback! I like your idea about a reflective ring on the hub motor to make the bike safer from the side, to increase its visual footprint. I personally do not feel uncomfortable or awkward when riding a step-thru but might opt for a mixte (mid-step) frame or get a masculine color on a wave frame. Once I’m riding, it’s all about having fun but there is something to be said for appreciating the aesthetic of your bike too. 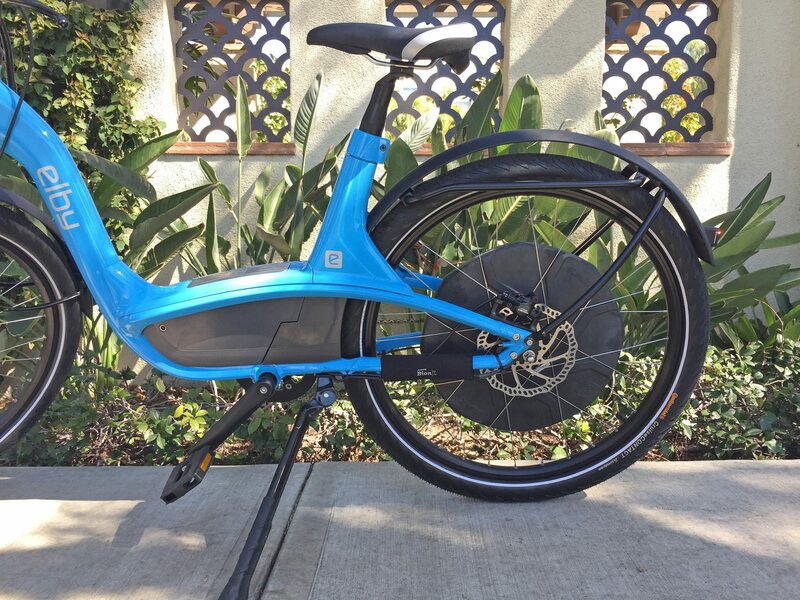 The knee pain I sometimes experience when riding a traditional bicycle is what led me to big, heavy, expensive electric bikes five years ago… and now I feel less sensitive about the trade-offs because my pain is less of an issue. I feel like I have also become less sensitive about the visuals of an electric bicycle and more focused on functionality instead. Hi, Tom! My personal guess is that the company will go through this receivership and restructuring process but come out still supporting and producing products. They have some great IP for the internal torque sensor design and have already done the heavy lifting to create molds, circuit boards, and get their products tested and certified for sale in Canada, North America, and Beyond. 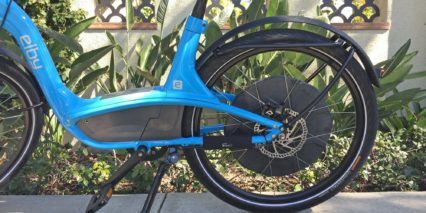 I spoke with Michael (from OHM) about BionX, since they use the BionX hardware on all of their ebikes, and it sounds like he is still getting support and moving forward. I cannot say for sure, but maybe this is just a necessary transformation to deal with the General Motors situation (I think a deal went sour over pricing estimates and there was a legal outcome that forced BionX’s hand). Hopefully, BionX will trim the fat and become a leaner company that can still offer their special products for many years to come :) you could get more feedback in the BionX forums from other people too if you’d like. 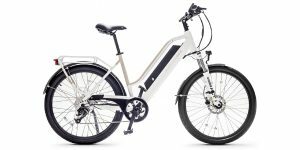 Sir, I have one simple question about all ebikes. Q. Why don’t they have a key to start the bike, but more important, the key to shut everything off, I sometimes pass through questionable neighbourhoods in Toronto, (yes folks, we have them too) and I want to stop at a shop for ethnic food, someone can easily .. well you know the rest. I am wondering what type of car bike carrier will accomodate the elby. We presently have an awesome Thule that is quite adjustable but the swival adjustable clamps must attach to the frame of the bike. I am interested in the elby but I am not sure our present carrier will work when looking at the frame shape of the elby. Hi Cheryl, can you please link to the Thule rack you have or tell me the model and year so I can investigate a bit more? I personally use a Küat rack like this which secures the front wheel from above and rear wheel at the bottom (with a ratchet strap). Sometimes the front portion does not work perfectly with fenders and I’ve learned that the bar can pull down on the main frame in that case. It would be great if you could test a step-thru bike that is similar to the Elby first or maybe visit a shop that carries them and test it out. 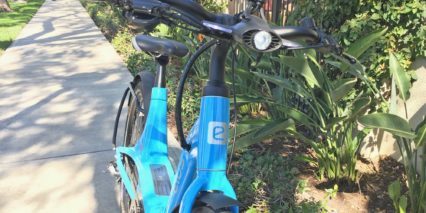 I hope these thoughts help you and suggest maybe posting in the Elby electric bike forums too so that others can chime in with ideas. Can panniers or a bike rack or a front basket be put on the Elby? Is it possible to take off front wheel easily to fit in back of a small car (Prius C). I am 68 with a hip replacement and a step through that is very stable is important to me. I will use for errands around town and going with husband on fun rides (he is a serious biker). Not sure if I should go with single speed or the 9 speed. Money not critical but the other bikes I am looking at are under $2,000. Is this the right bike for me? I don’t seem to have anywhere close to try it. (Live in Richmond, VA Velofix in DC). 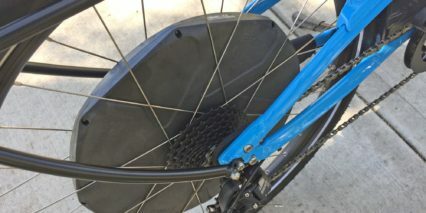 How about the metal baskets that go in the back off a metal bike rack? I already have two of these. Can you answer the question about the one vs 9 speeds?